Head pain comes in many forms, and when it’s severe it can debilitate you. The good news is that effective, cutting-edge treatments exist right now. Learn more about these conditions and how upper cervical chiropractic care can ease your pain, restore your health, and help you thrive. Migraines are recurring attacks of pulsing or throbbing pain that can be moderate to severe. They often affect just one side of the head. Before a migraine strikes, some people experience a loss of vision or flashing lights called an “aura.” During migraines, people become extremely sensitive to light and sound and may also become nauseated. Most migraine sufferers isolate themselves in a dark, quiet room, forcing them to miss family time, cancel work, or skip their favorite activities. Migraines affect about 12 percent of the U.S. population. Cervicogenic headaches are a common form of recurring head pain that is constant and can be severe. Headache sufferers often withdraw to bed for hours until the pain passes, making normal activities impossible. When people try to power through these headaches, many have difficulty thinking and concentrating at work or enjoying the company of others. 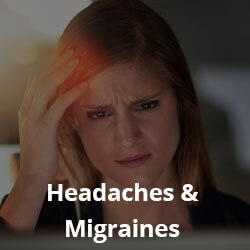 Migraines: Current research shows that a misaligned upper cervical spine can compress the brainstem, which sits at the bottom of the skull and connects the brain to the rest of the body like a switchboard operator. This compression can irritate the brainstem’s blood vessels, causing them to swell and ultimately trigger a migraine. Cervicogenic headaches: Trauma to the upper cervical spine can shift how the neck supports the head, creating an imbalance in the body. This imbalance can put pressure on head and facial nerves and cause muscles at the base of the skull to painfully contract. A body imbalance is the primary cause of many headaches. Sufferers typically experience head pain without neck pain. Thrive Head & Spinal Care offers upper cervical chiropractic care in San Antonio, TX, which corrects the upper-neck spinal misalignments that cause migraines and cervicogenic headaches. Our care is precise and gentle. It involves no twisting, cracking, or popping of the neck. Instead, we apply math, physics, and engineering principles to determine the correction you need to restore your normal position and function. We use pre- and post-correction testing to ensure that your nervous system’s performance has improved and your body has the best opportunity to heal. Don’t lose another hour of life to migraines or headaches. Thrive Head & Spinal Care’s mission is to provide the highest quality of upper cervical care with the fewest number of follow-up visits. Dr. Dutson sees every patient as a person, not as a condition. He wants to help you enjoy your life to the fullest and thrive. Schedule your consultation today.